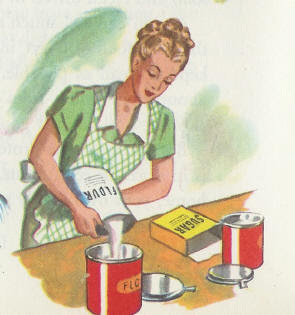 Spent most of yesterday in the kitchen — not looking half as feminine and efficient as the woman above. I made two very unhealthy but yummy cakes. One a standard recipe but the other was new. As so many American recipes it called for insane quantities of sugar which I — as always — cut in half. I had to get up early today to go to the studio to let in the chimney sweeper. Now, back home it feels much later than it is as I've been up for so long. I'll heat some leftovers for dinner, thank heavens for leftovers, and afterwards I'll return to L. M. Mongomery's Short Stories. Like so many of you I have lost track of how many times I've read her Anne books — but I think I like the books about Emily even better. The short stories I'm reading for the moment were written before the books about Anne and sometimes I get a feeling that she reused some of them in her Anne-books. Miss Sally and her Juliana in "Miss Sally's Company" reminds me very much of Miss Lavender and her handmaiden Charlotta the Fourth in "Anne of Avonlea". And this description of Miss Sally and her cottage — so typical for the author — doesn't it make you think of Tasha Tudor? When I read those books as a child I happily skipped all sunsets, cherry blossoms and rice lilies. All those things that I love to read about now. I'd like to visit P. E. I. but I'm not so sure that I want to visit Green Gables — I think I'll be disappointed — but I would like to see the sunsets, the red roads and all the plants she wrote about that don't grow here. "You look as if you had a corner in time, Curt,"
Sarah was always of a grumbling turn, and she had a brand-new stock of them this time. and she's as poor as second skimmings.